Bats are vital to our environment. They can consume a thousand mosquitoes in an single hour. They are helpful in seed dispersal and pollination. When they decide to move into your home or business; bats can create a big problem. QualityPro offers residential and commercial bat removal and bat control. We are fully licensed and insured with years of experience and work hand in hand with state wildlife agencies. 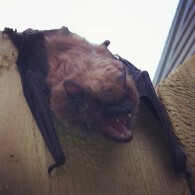 Bats in the attic is a common place to find these pest animals. We can help to remove bats in your attic. Emergency Bat Removal Westchester, Rockland, Bronx and Putnam Counties. Call QualityPro 24/7 for emergency bat problems. We can help you throughout Westchester, Rockland, Bronx, Putnam Counties and Greenwich, CT with bat removal. Call 914-712-6333. We can help you to humanely take care of your bats in the attic. Our professionals at QualityPro will control your bat problems. Bats have long adapted to living in attics and chimneys. Droppings on the outside of your home are usually a sign that you have a bat problem. Aside from bats being a nuisance, they do carry a number of diseases and parasites and bat control should only be attempted by a professional. Click here for facts on bats.